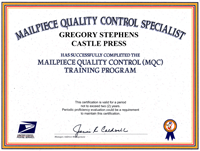 15 Castle Press Team members have completed the Mailpiece Quality Control course and have successfully taken the certification exam. This course is designed to assist the individual responsible for creating mail pieces for entry into the U.S. Postal Service’s mailstream. This program helps graphic artists, administrators, and sales representatives involved in the preparation of large mailings, accomplish their job with proficiency and confidence. Completing this course provides a better understanding of the acceptance requirements of the U.S. Postal Service as they relate to mailpiece design. In addition, Castle Press team members possess an understanding of the requirements of the presorted mailing process to analyze discount and payment options for our clients. Poor mailpiece design can cause delays in the processing and delivery of your mail. Mailpiece quality control is a systematic method of ensuring that designs coming from individuals in your company are acceptable for mailing and are eligible for worksharing discounts from the Postal Service. Good designs give you the confidence that your time and effort will pay off in postal “worksharing” discounts and successful postal processing of your mail.